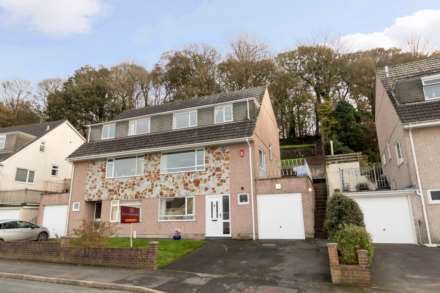 A beautifully presented holiday home situated in the ever popular Bovisand Park. Located towards the end of the estate the property enjoys an elevated position which provides stunning sea views looking over the breakwater and beyond. Internally the current owners have modernised the property to include a recently fitted kitchen and double glazing. Offered with allocated parking and no onward chain this property must be seen. Double glazed patio doors to the front providing panoramic views out over the bay and taking in the breakwater. Airing cupboard. Wall mounted electric heater. Door to the inner hall and open plan into the kitchen. Measurements including units. Fitted kitchen with high gloss base and eye level storage cupboards. Roll edge work surfaces. Stainless steel sink and single drainer with mixer taps. Tiled splashbacks. Double glazed window to the front providing sea views. Built in oven and hob. Hot water heater. Doors into bedrooms and shower room. Double glazed window to the rear. Double glazed window to the rear. Double glazed door providing access to the rear path. Fitted shower cubicle and shower unit. Wash hand basin. Low flush WC. Tiled splashbacks. Obscure double glazed window. At the front of the property is a low maintenance paved patio enjoying open sea views looking towards Plymouth and the breakwater. Term of 99 years from 12th September 2000. Property may be fully occupied 1st March to 6th January with day use only during the "closed" period.